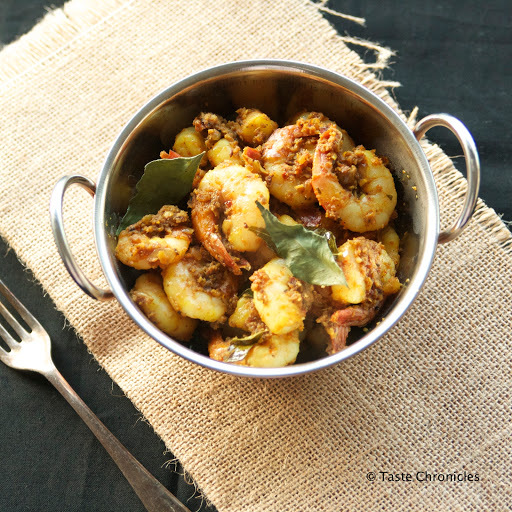 I use Kashmiri red chillies and red chili powder as this variety is milder than others but sill gives the dish a bright red color. If you're using any other variety of red chillies please adjust the quantity or you might need to have a Fire Extinguisher handy. 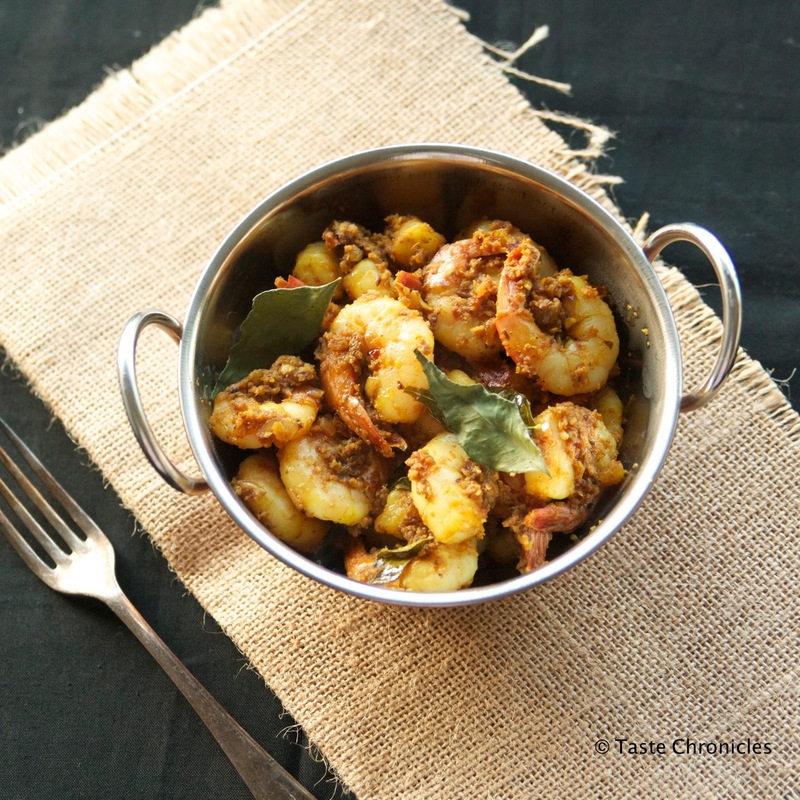 I have used frozen coconut here. Fresh coconut is of course ideal but I wouldn't recommend using desiccated coconut. 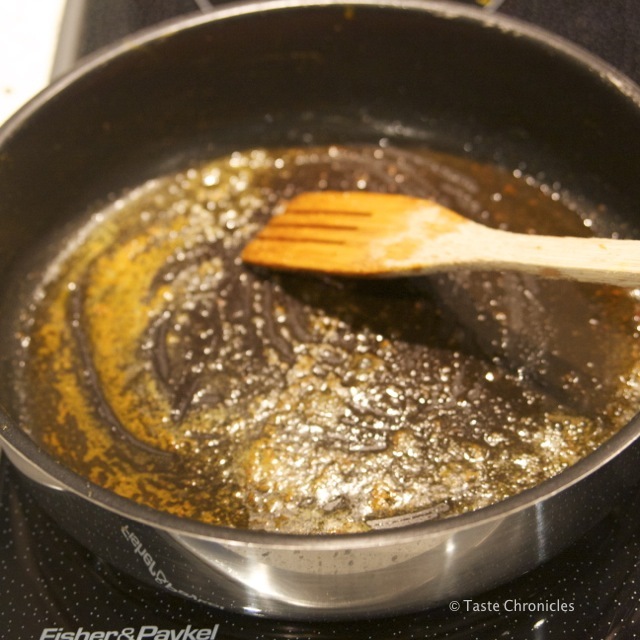 To get started, prep your ingredients. Finely dice the shallots. 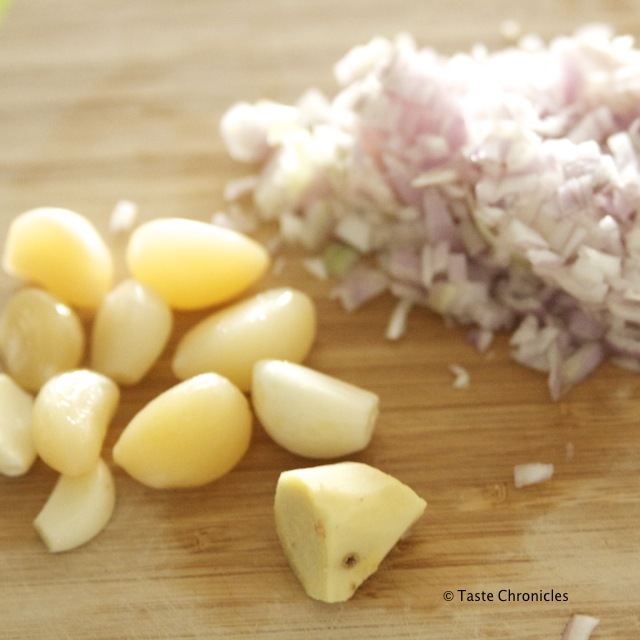 Peel and clean garlic and ginger. 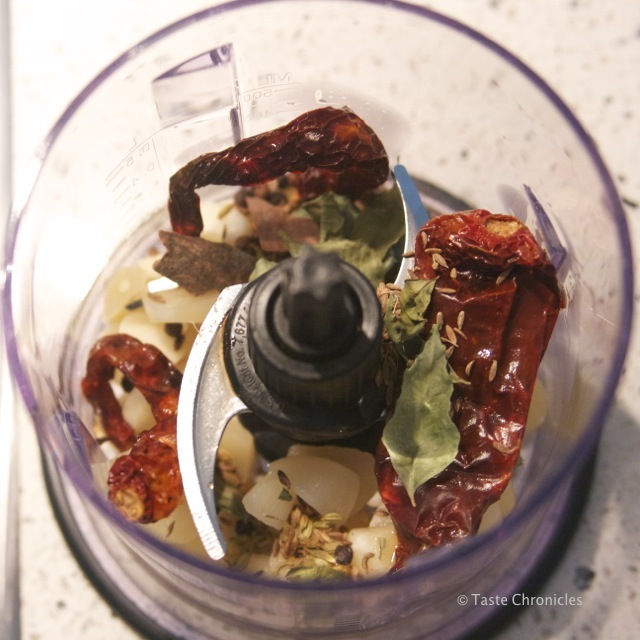 Soak the Kashmiri red chillies in enough warm water to cover. I just microwave the chilies in water for 20 seconds and leave it alone while prepping the rest of the ingredients. 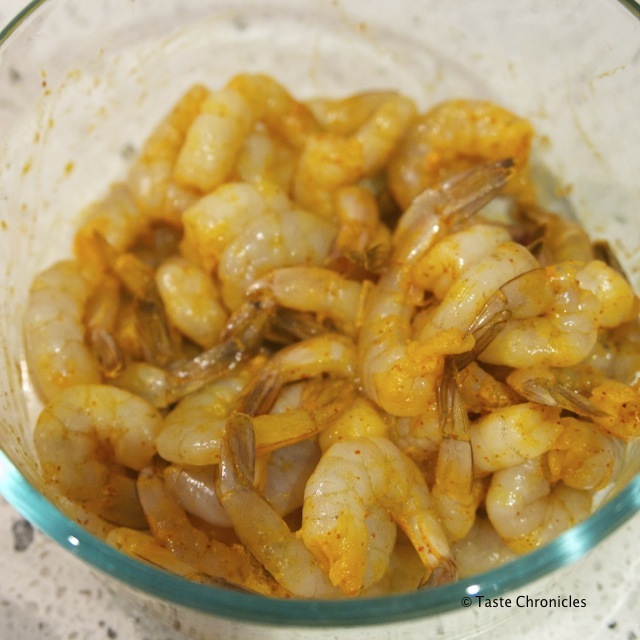 Rub salt, 1/4 teaspoon turmeric and 1/4 teaspoon Kashmiri red chili powder to the prawns and set aside. 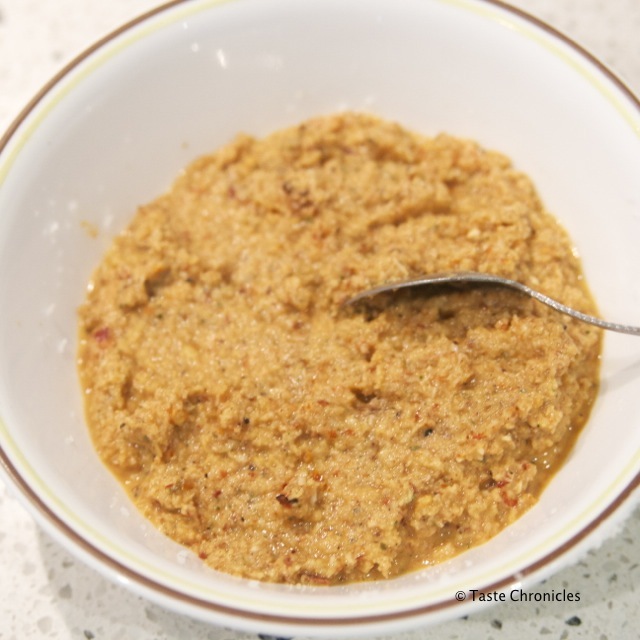 Dry roast cumin seeds, fennel seeds, whole black pepper, cinnamon, cloves, coriander seeds and a few curry leaves over low - medium heat. 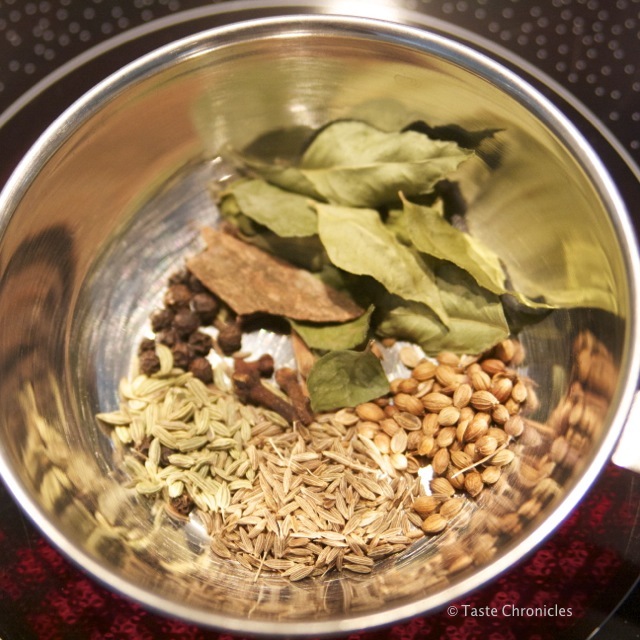 I have used dry curry leaves here, so they are not as potent. 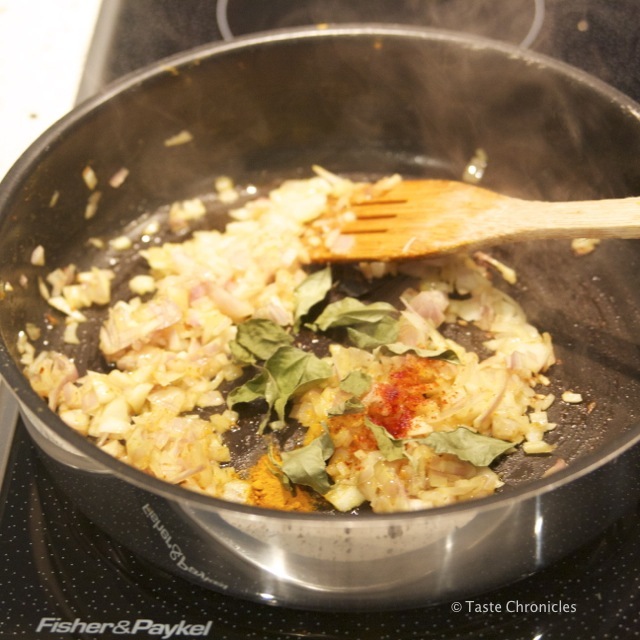 If using fresh curry leaves, use about 4-5. Dry roast till fragrant, taking care to not burn it. 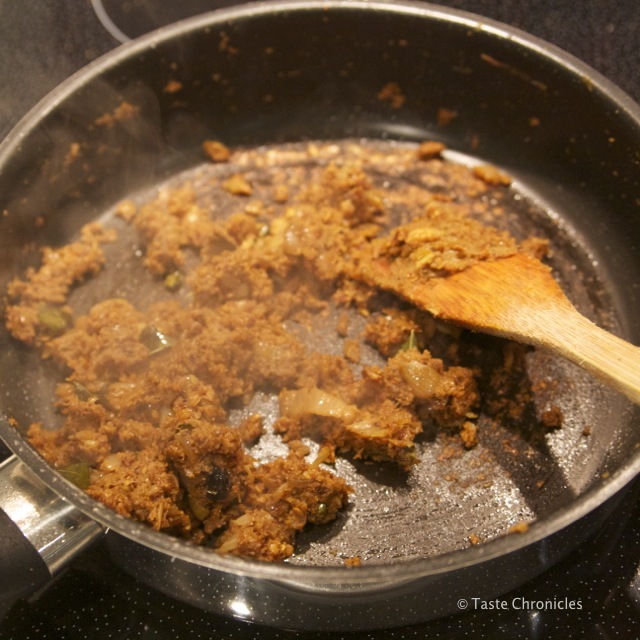 Blitz together the ginger, garlic, soaked red chilies (discard the soaking liquid) along with all the roasted spices. 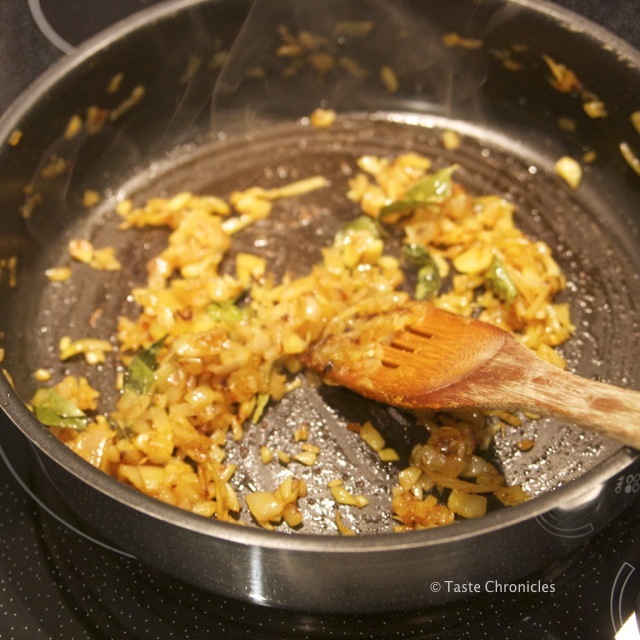 Add grated coconut. 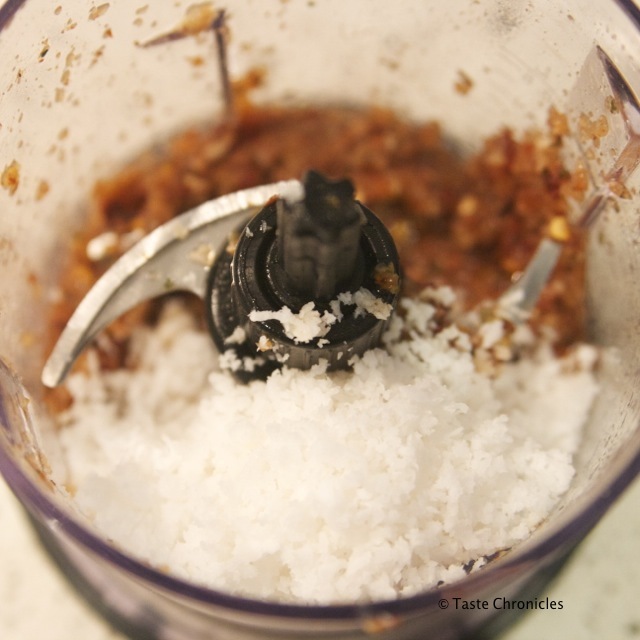 Add a little water if you need to blitz into a thick smooth paste. 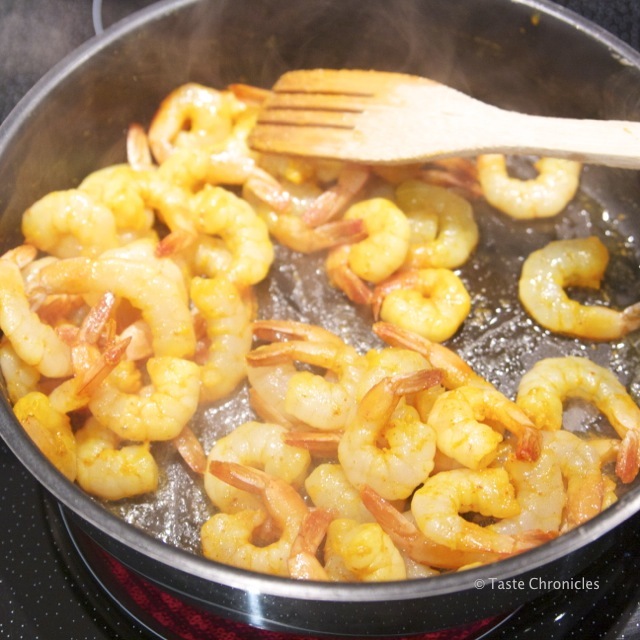 Heat oil in a skillet and lightly saute the prawns. 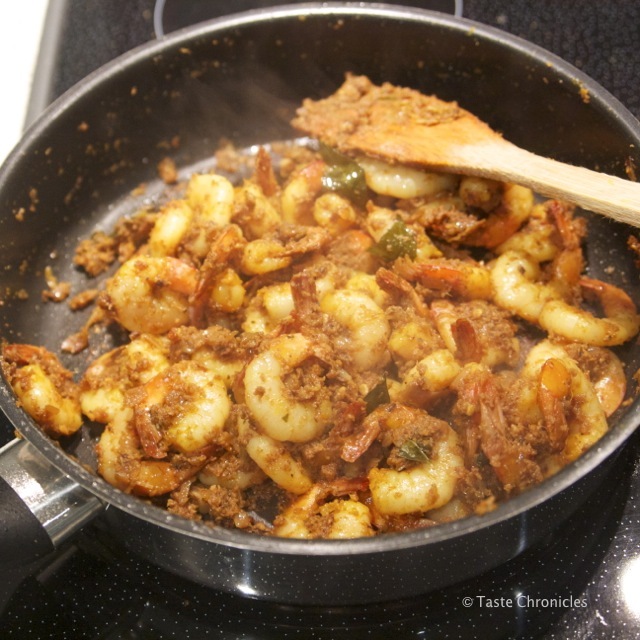 The prawns will finish off cooking in the masala later so at this stage you're only looking to cook it partially so that it loses a lot of the water - about 2-3 minutes. Add a dash of asafetida. 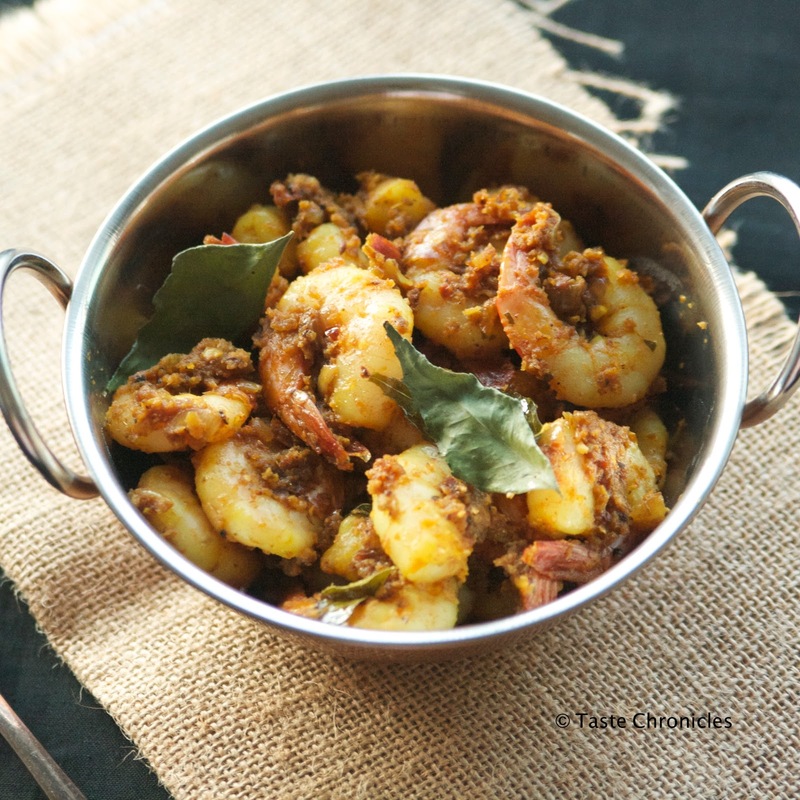 Toss in chopped shallots, rest of the curry leaves (7-8 leaves) and 1/4 teaspoon turmeric and 1/4 teaspoon Kashmiri red chili powder. Cook this together till the onions are well cooked. 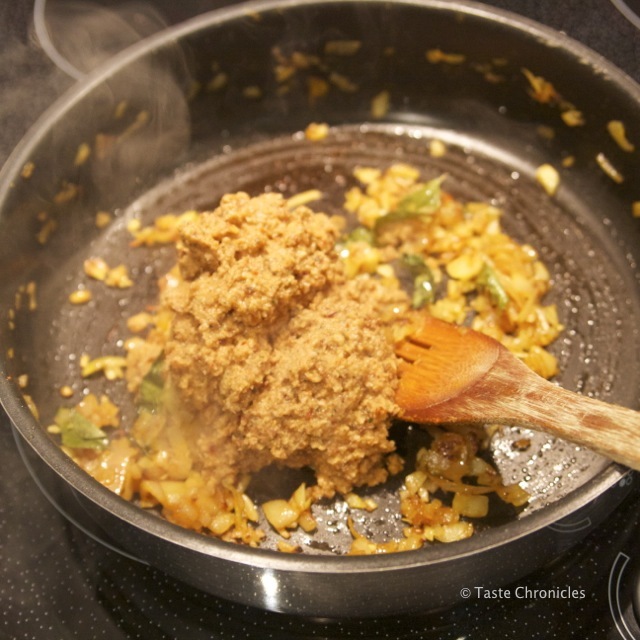 Add the masala paste, add coriander powder and salt and cook on medium heat while stirring frequently. 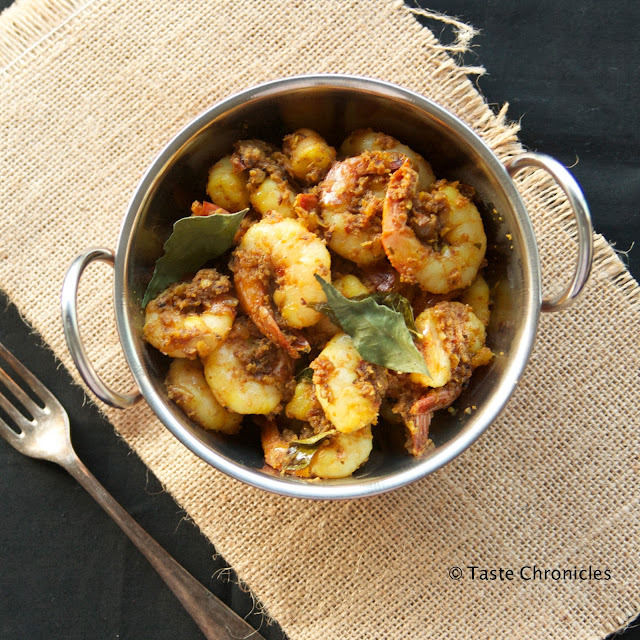 Add the partially cooked shrimp in and combine with the masala. 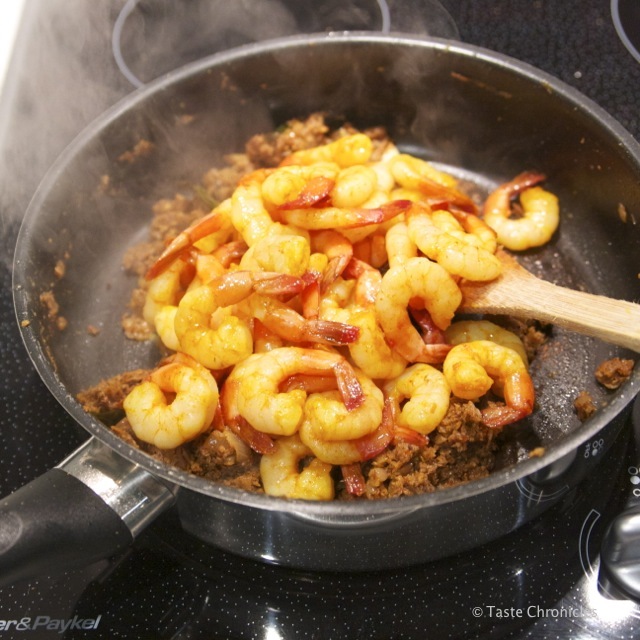 Cook it all together for about 3-4 minutes and you're done! Serve with rice or just dig in!